Candied Walnuts: Preheat oven to 350 degrees Mix walnuts, egg white and sugar together in a medium bowl. Place on sheet pan and bake at 350º degrees for 15 to 20 minutes. Let cool, then break into pieces if necessary. Dijon Balsamic Vinaigrette: Whisk together vinegar, mustard, garlic, pepper, and salt. Whisking continuously, slowly pour in the olive oil. Cover and refrigerate until ready to use. Salad: Clean and dry salad greens. 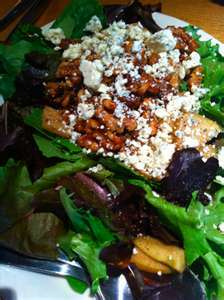 Add greens to large salad bowl and mix in 1/2 cup salad dressing, tossing to coat greens. Add pear slices and candied walnuts. Toss briefly to coat. If desired, crumble Gorgonzola on top of salad as garnish. At California Pizza Kitchen you can get this salad with grilled shrimp or sauteed salmon. Need To Boost Your ClickBank Commissions And Traffic? Bannerizer makes it easy for you to promote ClickBank products by banners, simply go to Bannerizer, and grab the banner codes for your selected ClickBank products or use the Universal ClickBank Banner Rotator Tool to promote all of the available ClickBank products.